Createspace Independent Publishing Platform, 9781539012467, 210pp. From National Bestselling author Jennifer Fischetto comes another laugh-out-loud Gianna Mancini Mystery... When Gianna Mancini, reluctant ghost whisperer and plus-sized shoeista, attends a bridal shower for a family friend, she doesn't expect to see her favorite movie star, Raina Stone in attendance. Too bad Gianna's gift of communicating with the dead doesn't give her the ability to predict the future. If it did, she'd have known she was about to stumble on Raina's dead body. The police rule it as an accident, but something feels off to Gianna. With the help of her dead Aunt Stella and a grumpy ghost named Freezer Dude, Gianna discovers that the celebrity was harboring secrets from her past. Secrets that may have contributed to her death. Between spying on suspects with Aunt Stella to having to rescue her favorite boots from Raina's quirky manager, Gianna has her work cut out for her. The closer Gianna gets to the truth, the more danger seems to find her, and if she's not careful, she may just end up crossing to the other side. 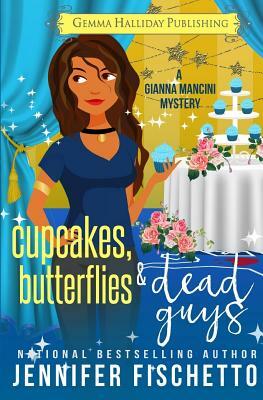 Gianna Mancini Mysteries: Lipstick, Lies & Dead Guys (book #1) Miniskirts, Mai Tais & Dead Guys (book #2) Christmas, Spies & Dead Guys (holiday short story) Cupcakes, Butterflies & Dead Guys What critics are saying about the Gianna Mancini Mysteries: "Quirky but oh so fun cozy mystery. If you like your cozy mysteries on the humorous side, then look no further " -Fresh Fiction "Jennifer Fishetto serves up a delicious cozy mystery with this fun ghost story. If you are a fan of the genre this is a fun read that will leave you with a smile." -Night Owl Reviews. Jennifer Fischetto is the National Bestselling Author of the Jamie Bond Mysteries. Unbreakable Bond, her adult debut novel, has received a National Reader's Choice award nomination. She writes dead bodies for ages 13 to six-feet-under. When not writing, she enjoys reading, cooking, singing (off-key), and watching an obscene amount of TV. She also adores trees, thunderstorms, and horror movies-the scarier the better. She lives in Western Mass with her family and is currently working on her next project.